From left to right, members of The Longest Day committee, Sarah Dutton, Valerie Carobeh, Barb Creamer, Abby Hendricks, Beth McCane. 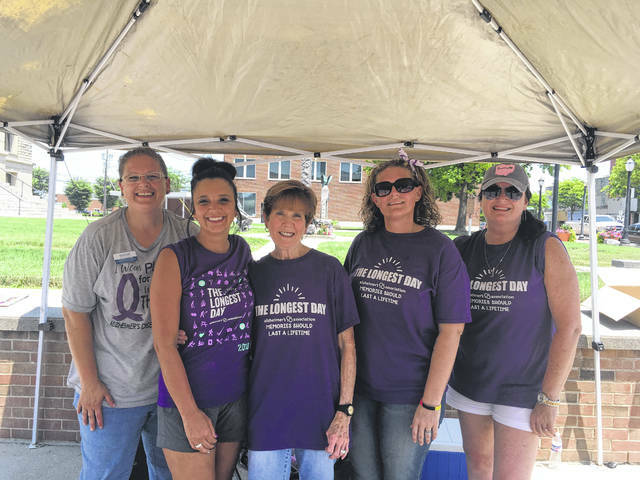 About 150 members of the community participated in The Longest Day® activities Saturday, according to committee chair and director of sales and marketing at Carriage Court of Washington Court House, Beth McCane. McCane said the event “went well” and that it was successful both in terms of increasing awareness of Alzheimer’s Disease and in raising money for the Alzheimer’s Association. In addition to providing funds for the important work the Alzheimer’s Association does, The Longest Day® helps to raise awareness of Alzheimer’s Disease. Awareness is important because it educates people of warning signs to look for in themselves and their loved ones, highlights the toll that Alzheimer’s Disease takes on both those who suffer from it and their caregivers, and encourages communities to support individuals who have been affected by this disease. McCane said she is grateful to everyone who attended the event, all sponsors and volunteers, members of the committee, and everyone who worked to make the event a success. “We definitely want to thank everybody that helped,” she said. https://www.recordherald.com/wp-content/uploads/sites/27/2018/06/web1_longest-day.jpgFrom left to right, members of The Longest Day committee, Sarah Dutton, Valerie Carobeh, Barb Creamer, Abby Hendricks, Beth McCane.